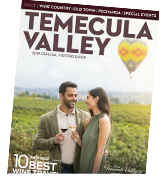 Experience a taste of Temecula Valley's Wine Country in Old Town Temecula. Over the last few years, winery tasting rooms and wine tasting bars have opened in Old Town Temecula to bring a taste of wine country to historic Old Town. You will find everything from quaint tasting rooms where local wineries offer wine tasting to upscale wine bars that offer local wines by the glass as well as flights from around the world.